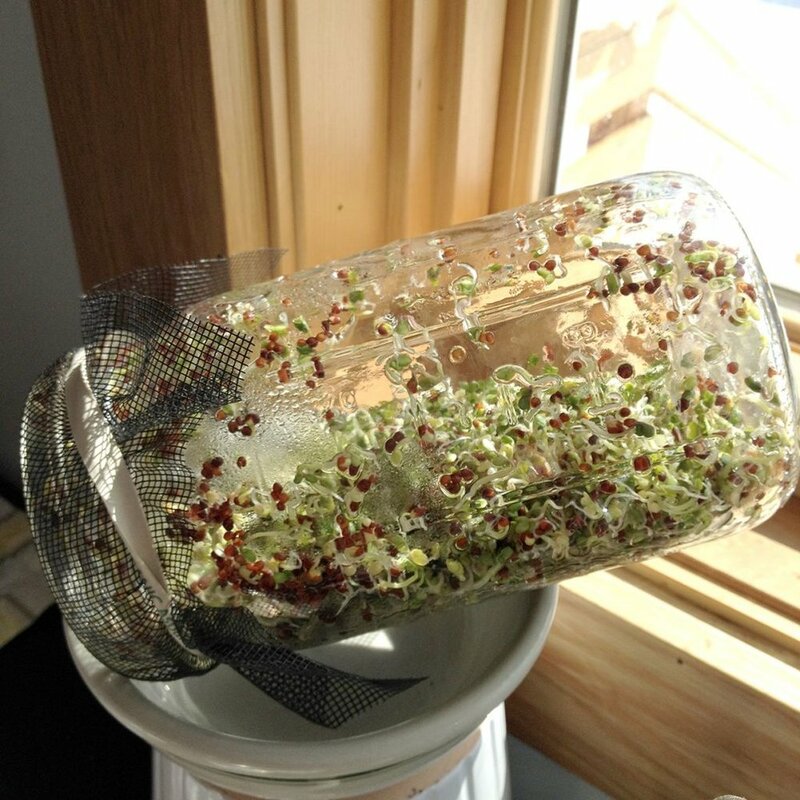 Sprouts are probably one of the most potent ways to add superfoods to your diet. Combine them with kale or spinach, sea veggies and a light vinaigrette and you have the ultimate in a Superfood Very Big Salad (VBS). If you buy sprouts instead of sprouting them yourself, look for very fresh sprouts that smell good and have juicy looking roots and eat them within 3-4 days. Why eat sea veggies? They are an excellent and natural food source of iodine, important for thyroid health and balancing hormones. Sea veggies also contain a highly absorbable form of calcium as well as iron and plenty of other nutrients, including potassium, zinc and vitamins C, Bs, D, E and K.
Have you started sprouting? Let me know how it goes! 1. Soak the wakame in a small bowl with the filtered water. Let stand while you prep the kale. 2. Rinse the kale, remove the leaves from the stems and discard stems. Roughly chop into small pieces and place in a medium bowl. Drizzle the olive oil over the kale and massage with both hands until the kale becomes dark green and glossy. 3. Combine dressing ingredients in a small bowl, then taste and adjust flavors if necessary. 4. Drain and discard the water from the wakame and squeeze out the remaining water with your hands. Add the wakame to the kale, then toss with half of the dressing. Test a leaf and add more dressing if needed. Top with the optional add-ins, the carrots, radishes, sunflower seeds and sesame seeds. Serve immediately or prepare up to four hours ahead. Store unused portion (greens only - without add-ins) refrigerated in a glass container and eat within 3 days.